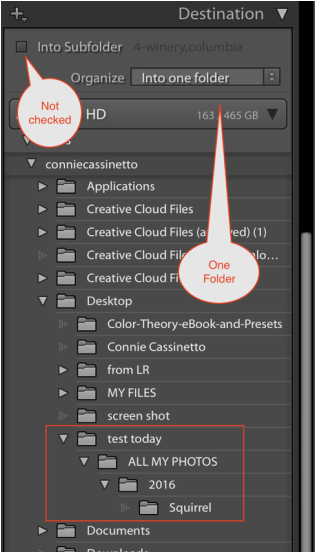 When you create a folder within Lightroom it is being created on your computer wherever it is that you have chosen to store your many photographs (knowing exactly where this is will save you grief over time). Lightroom is not a data base and does not store your folders and files, it simply allows those folders and files (wherever you have put them) to link to the program where you can then work with them as needed in the program interface, which consists of a workspace and various panels. Having explained that, when you do create a folder within Lightroom it actually does create a new folder on your computer: if you move photos from one folder to another within Lightroom the program actually moves the files on your computer from one folder to another. If you use Lightroom as an editing software program, it is always a best practice to only move folders from within Lightroom. In the Library Module left side panel, create a new folder within your folder structure by right clicking on the specific folder where you want to import your photos. I use a year and subject structure and I could create a folder within in a folder (i.e., subfolder) by right clicking directly on 2016 (a main folder under my “parent” folder called ALL MY PHOTOS) and then create a subfolder within 2016 using the subject name for the shoot. 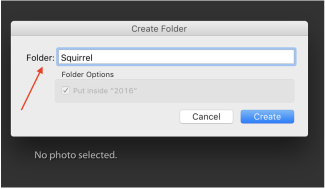 In the example left, I have right-clicked to create a folder within 2016 that says “Squirrel.” When I right-clicked on the 2016 folder a pop-up box appeared that said “Create Folder.” Using this method of importing, I do not have to tell the computer where to put the new folder as that was decided when I clicked on the main folder to create the subfolder. When the pop-up box appears, type the new folder name in the box and click Create (so I typed in “Squirrel” in this example.) Do not put a checkmark in the Include selected photos for importing: you might use this option if you were moving photos from an existing folder to a new folder. You will see the newly created folder within the folder structure in the left panel and the number “0” across from it (as in the example above). Visually check the structure showing in the Folders panel to ensure that the folder creation has worked as you intended. At this point, if you needed to move the newly created folder (perhaps you’ve changed your mind on where the new folder should go), you could do that in the folder panel by clicking, holding, and dragging the newly created folder into another folder of your choice. You could at this point simply click on Import and carry on as noted below. However, there is another option. 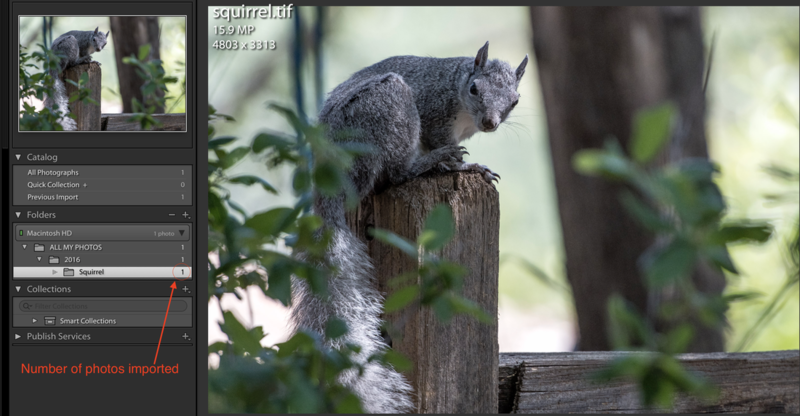 Right click on the folder that you want your photos to be imported into (in this example "Squirrel) and near the bottom third of choices you will see Import to this Folder. If you import using this option, that specific folder will be marked when you do import so you won’t have to worry about where the photos are going to end up. When you click on this option it takes you directly to the import window working space. If using the Import button and you have put a card into the computer or hooked up your camera to import from it you will see your photos in the center workspace area. If you had planned to use a folder holding photos already on your computer, you will see the usual “Please select a source” instruction. If needed, select your source for the photos using the left side panel and the source file will show up in the center workspace area. Be sure to check that the options at the top of the workspace are correct for what you are doing, normally you will use copy if the photos are new. Copy means a copy of the photo is put into the folder of your choice: the original is left on your card or whatever was the origination point. Move simply moves a photo from folder A to folder B and does not create a copy (in this case I used move because my photo was in a folder on my desktop and I just wanted to move it into another folder, called Squirrel, where I store my photos, i.e., the ALL MY PHOTOS folder). On the right panel, the Destination panel is show in the example at the left, navigate to the already named chosen folder if it is not already highlighted, which it should be if you used the right-click option (in this example, “Squirrel”) that will show up as a subfolder in the folder where you created it. Check that all panels in the import panel are set as you intend them to be (something you should always do). Be sure that in the Destination Panel the Into Subfolder box is NOT checked: this is what leads to problems for many people. The box below that line in the Destination panel should be set to Organize: Into one folder. Click on Import at the bottom right and the import will begin. When the import is done the number of photos in the file you’ve created will go from “0” to the number of photos imported. 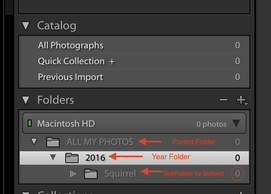 As you can see in the example below I now have a new folder called "Squirrel" that is a subject subfolder under my year folder, in this case, 2016, and both folders are contained in a main folder called ALL MY PHOTOS. 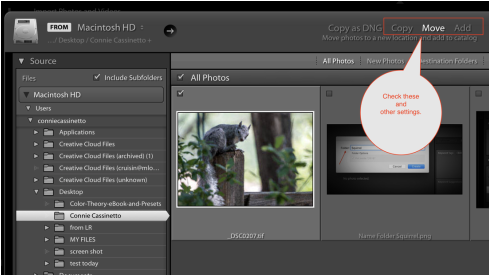 My new photo of a squirrel is now showing in the Squirrel folder and the folder shows that one photo was imported. The structure you choose to use is up to you but the process of importing is the same for any structure you choose. As with any new procedure, do a couple of test runs to see how everything works before you import a large number of photos. If you need to delete a folder and start over you can easily do that within the left Folders panel. The best part of Lightroom is that there are multiple ways to work within the program: the worst part of Lightroom is that there are multiple ways to work within the program! There are other ways to create folders and import within Lightroom, but this is one easy way to create folders and import into them that may prevent you from “losing” your folders within the folder structure and then spending hours trying to figure out what you did when you imported.